Sweet and salty deserts are all the rage, and while you may not think to combine such flavors the outcome is really quite amazing. 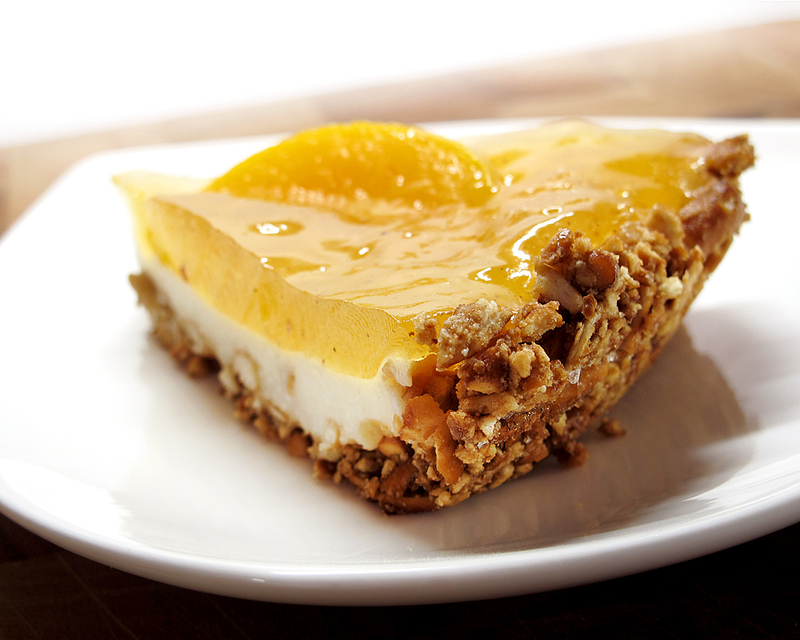 A little saltiness from the crunchy pretzel crust of this pie really brings out the sweet flavor of the peaches with a cool layer of creamy cheese in the middle. The peach layer, made with peach nectar rather than preflavored peach gelatin, is velvety and delicious with a dash of cinnamon and honey to give it a little spice. I wrote this recipe especially for the Cooking Channel where you can find the recipe complete with process photos. WHAT. IS. THIS. My boyfriend is going to die when I make this for him. Haha! He should. My boyfriend LOVED it. I’m going to have to make it for him again. Enjoy!